A postcard featuring a night scene of West View Park in West View borough along Route 19. 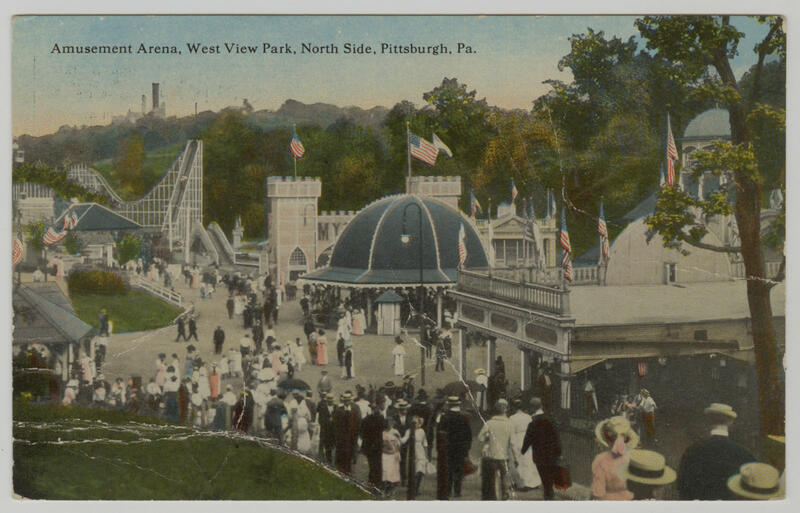 The park opened in 1906 and closed in 1977, entertaining generations of young people and their families in the Pittsburgh region. For more than 70 years, the location served as a favorite entertainment spot for area Pittsburghers. Up the street from the sign at a nearby Isaly's, Janet Pazzynski brushes her finger against a thick black frame in a back booth. A little dust falls from the frame, as she explains the contents inside. 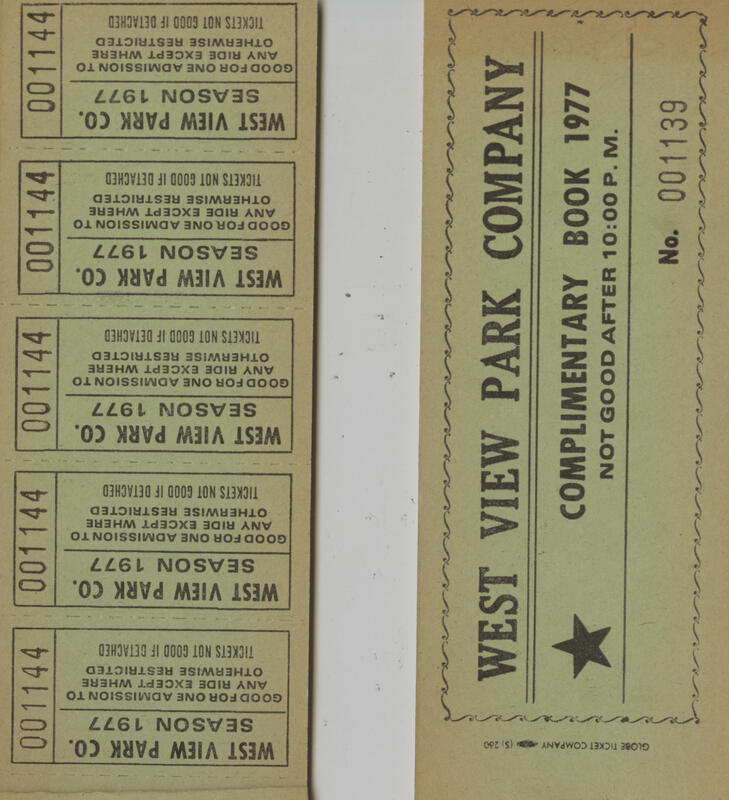 West View Park complimentary ticket book from 1977. Admission to the park was free, however concessions and rides cost a varied amount of tickets. She passes by black-and-white images of children buckled into wooden roller coasters, toddlers riding in miniature vintage cars and young adults walking toward a large, colorful ballroom. Pazzynski isn’t here for the restaurant chain’s famous chipped ham or swirly ice cream cones. She's here for the proximity: Isaly’s is about a block away from where Pazzynski once made some of her favorite childhood memories at West View Park. Pazzynski says as a kid, West View was meaningful for everyone who grew up in this part of Pittsburgh. It was the site of school picnics, church dances, and endless entertainment. West View Park was a staple of the community for more than 70 years. Founded in 1906 by the T.M. Harton Company, the amusement park was a first for the business. The company owned and operated rides at other area parks, according to historian Harry Michelson, including Conneaut Lake Park and Cedar Point. Then, in 1906, Harton decided to open his own park in the growing borough of West View. 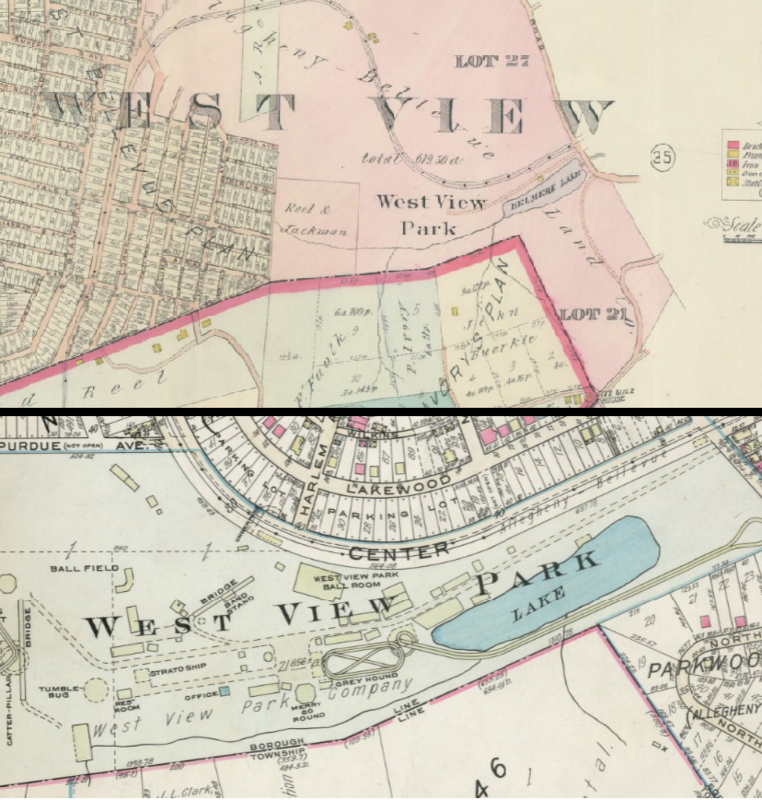 Historic maps of West View Park from 1906 (top) and 1940 (bottom) show how the park evolved over time from a small plot of land in a developing area to a significant attraction and chunk of the borough. Construction began on a swampy, green space and former picnic area along Route 19 in West View. A nearby lake, which Michelson said was once nicknamed Lake Placid, but really called Belmere Lake, served as home of the park’s first paddle and swan boat rides. The main entrance and bridge leading to West View Park, c. 1918. 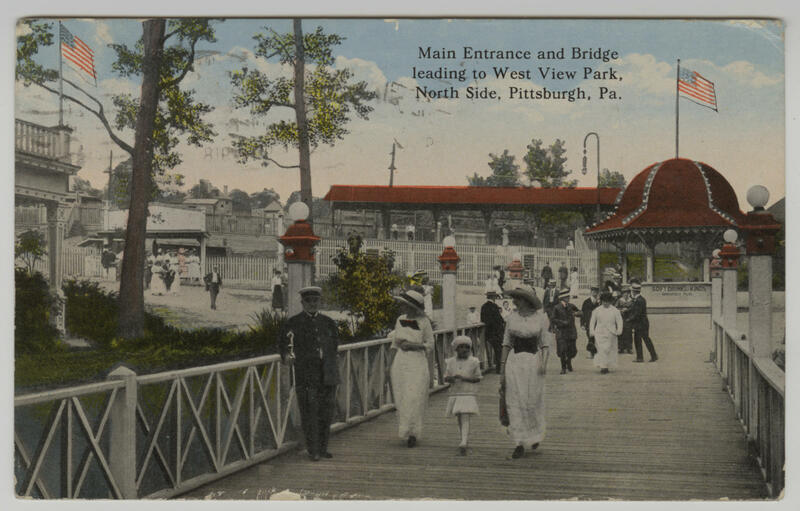 The Sunday morning Pittsburgh Post on April 29, 1906 said the park had “a veritable fairyland appearance” and was predicted to be “an ideal family institution.” West View Park was considered a getaway from the smokey, noisy industrial city center. About a month later, the park officially opened to crowds that had “awaited anxiously by thousands for weeks.” It cost about $250,000 to construct, which according to an inflation calculator, would be about $7 million in 2018 dollars. It featured attractions including a Figure 8 roller coaster, electric merry-go-round and Shoot-the-Chutes -- a water plunge ride with a huge splash at the end. Several years earlier during the 1895 Pittsburg Exposition (the “h” hadn’t been restored to the city’s name yet) on the North Side and in Point State Park, residents were introduced to a “twin switchback railway” roller coaster. But Michelson said that coaster burned down and Exposition officials hired the T.M. Harton company to build a new ride for the 1901 Exposition. Visitors to West View Park in the Midway around 1961. In the background are the Big Dips, one of the most popular attractions at the park. Over the years, Harton was the primary manufacturer of West View Park’s roller coasters, including the famous Big Dips and Racing Whippet. They were often designed by legendary ride engineer Edward A. Vettel. He and his family lived and worked in Pittsburgh in until his death in 1952. At that time, it was estimated he’d overseen the construction of more than 80 thrill rides across the country. Fun houses were common attractions at parks in the early 20th century, Michelson said, and West View was no exception. A Katzenjammer Castle, House of Hilarity and Boot Hill were several rides featured throughout the years. Visitors could pay a ticket or two--plus a tax ticket--for a ride on any of the coasters, indoor rides or flat rides, like the Tilt-a-Whirl and Tumble Bug. 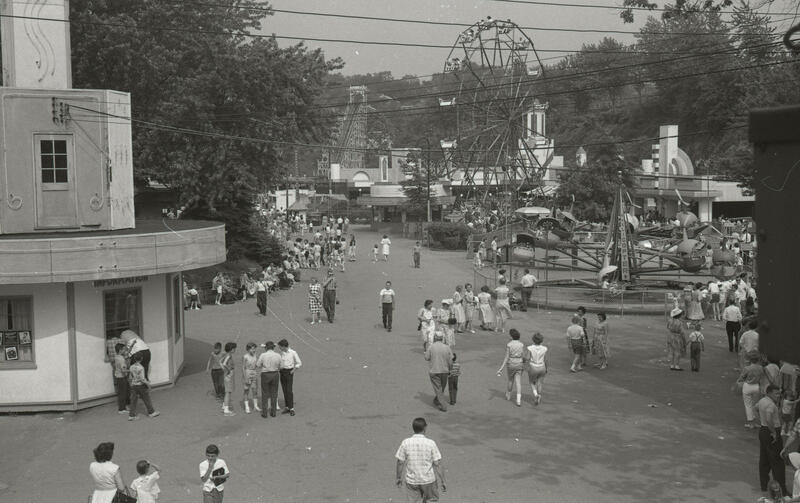 The Isaly's in West View borough contains many old pictures and props from rides at West View Park. This bovine skeleton was part of a walk-through scary ride called Boot Hill. To the right underneath it is a picture of the Racing Whippet roller coaster. Getting to West View Park was a thrill in itself for many young visitors. Jeanne Stelmak grew up on the North Side and said West View Park was an important part of all her summers, and especially loved getting there by streetcar. A streetcar pulls up in West View next to the hills of the Big Dips. This picture hangs inside an Isaly's in West View, along with several other historic pictures. Unlike Kennywood, West View Park didn’t fall under the traditional definition of a “trolley park,” said Michelson. There were often green recreation spaces pre-amusement park that were built at the end of trolley tracks or rail lines in an effort to attract people to visit that area. This was the case with Kennywood, Michelson said, but not necessarily with West View. Janet Pazzynski stands in front of the sign for West View Shopping Center. The site was once the home of West View Park, which is why the top of the sign has a small carousel horse. Pazzynski says her favorite ride was always the Big Dips, but she also enjoyed several of the flat spinny rides. With Kennywood Park in the city’s eastern section and West View Park in the northwest, which amusement park Pittsburghers attended was largely dependent on where they lived or worked. Charles Jacques Jr., who wrote the book West View Park: Goodbye, Goodbye, said there was an invisible divide in the city. Lifelong Pittsburgher Jim Werbaneth started going to West View Park as a Kindergartener and continued throughout his adolescence for school picnics and family events. Young children ride in antique cars in Kiddie Land, the section of West View Park reserved for young families. In fact, he said with a laugh, he’s never even been to Kennywood. The park’s tenure lasted through the first and second World Wars and subsequent beginning of the Baby Boomer generation, people born between 1946-64. Families had several children during this period, which meant bigger schools and a higher pool for potential West View Park attendees. Emma Lee Hartle started kindergarten in West View in 1957 and said she remembers kids being everywhere growing up. West View Park was the closest, best option in town for most children her age, Hartle said, especially considering there weren’t Disney resorts, Six Flags or Sea Worlds. “But no kid from West View was making it out to California to see Disneyland,” she said. 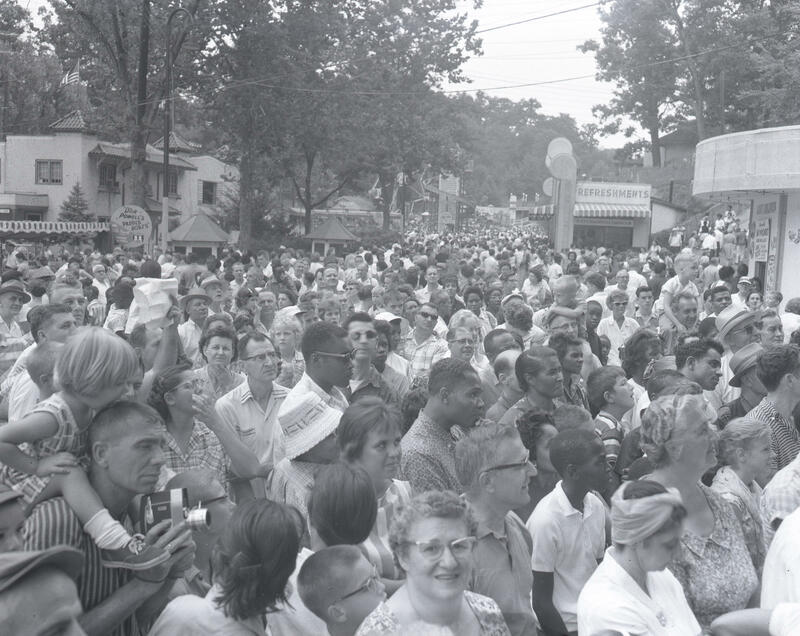 A crowd gathers for KQV Appreciation Day at West View Park, August 23, 1960. Admission to West View Park was free, however tickets were the way to actually get on the rides. Parents would hand their children a handful or armful of tickets for concessions and rides and ask them to check in with them occasionally. “Our school or church always had a pavillion up in the picnic area and usually our parents were up there playing Bingo and the kids were running all over the park,” Jeanne Stelmak said. The food and drink offerings were pretty typical of amusement parks at the time--pizza, ice cream, soda. It was all decent, Stelmak said, but it was universally known to stay away from the water fountains. Arcade games cost just a penny, so Stelmak said she and her friends would spend the summer saving. The park could be a romantic place for many area teens, said Emma Lee Hartle, because it was somewhere your parents weren’t. Listen to Pat Trapani describe her first kiss on the Big Dips roller coaster at West View Park. Every West View Park visitor has a memory of Danceland. The grand, wooden ballroom was filled with lights and music on a regular basis and became the hotspot for teens and young adults to socialize. Listen to Carol Kau talk about how her parents met at West View Park's Danceland. Dancing was a common pastime in the first half of the 20th century, with churches and social organizations holding dances weekly. Music would be provided by live orchestras, local singers, traveling groups and DJ’s. Before they were really big, the Rolling Stones played their first Pittsburgh show there in 1964. Throughout the 1960s, teens remember dancing to the mixes of DJ Mad Mike on Saturday nights. Listen to Pat Trapani describe meeting her husband at a dance at West View Park in a short story called, "How I Met My Spouse." For the most part, anyone could attend a dance at Danceland. In 1954, Pat Trapani met her husband at West View Park’s Danceland. She said her first encounter with her husband was when she and her friend tried to get into the park. The meeting sparked the beginning of the couple decades-long romance--their 64th wedding anniversary is coming up. Membership to Danceland, Trapani said, largely had to do with who the venue was trying to attract and who they were trying to keep out. The Amusement Arena of West View Park, c. 1919. Emma Lee Hartle echoed Trapani’s sentiment, saying just talking about West View Park without the context of segregation would paint an inaccurate picture of the place. In 1973 Danceland burned to the ground. The park didn’t have the funds to rebuild and it was, by most accounts, the beginning of the end for West View Park. By 1977, West View Park was started to show its 71 years. Harry Michelson said it was falling behind the times, unable to sustain itself financially and compete with other larger, better funded parks. “A lot of people point to [that was around the time] Kennywood put in their first million dollar ride, the Log Jammer, in 1975, and that was the straw that broke the camel’s back,” Michelson said. But a number of factors contributed to West View’s decline. The famous school picnics that once brought hundreds of students were no longer, as the region’s population declined and families had fewer children. After the park was dismantled in the late 1970s and early 1980s, it was announced that the site would be turned into a shopping center. But for devotees of the park, West View made a significant impression on their lives. Special thanks to the Facebook group Pittsburgh Born & Raised for their help. *This post was updated to reflect that Danceland burned in 1973, not 1972.